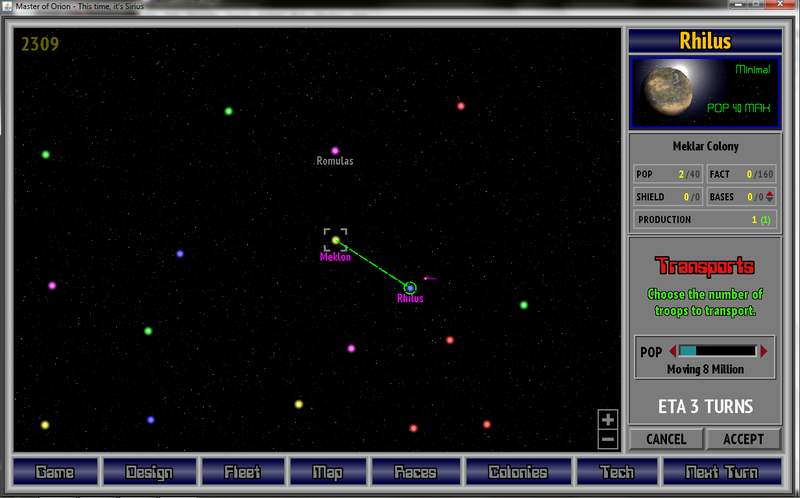 For starters, you get a map of the portion of the galaxy that your ships can reach. That’s all that matters here. You can click on a fleet on the map and display it on the right. There will also be a listing of fleets on the right that you can selected from. There are buttons above the map, one for each ship design you have. When depressed, any fleets containing that design will start to glow. 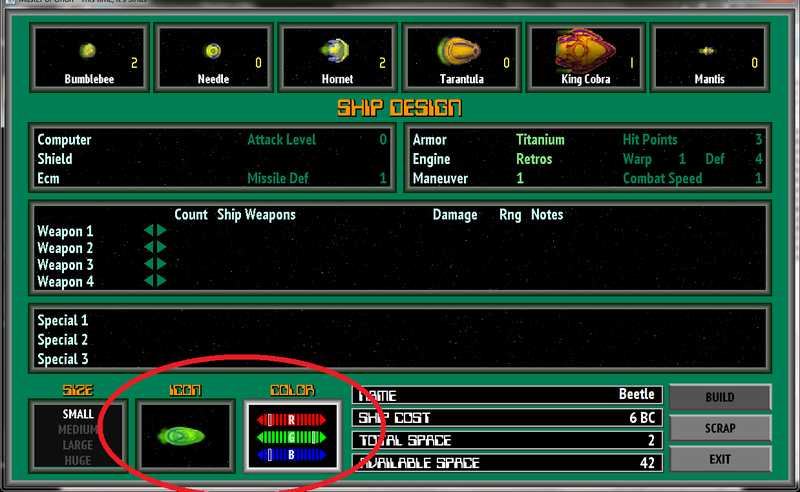 This will allow you to find ships quickly, along with their location within your empire. Ships and transports will be shown here. That’s the goal, anyway. 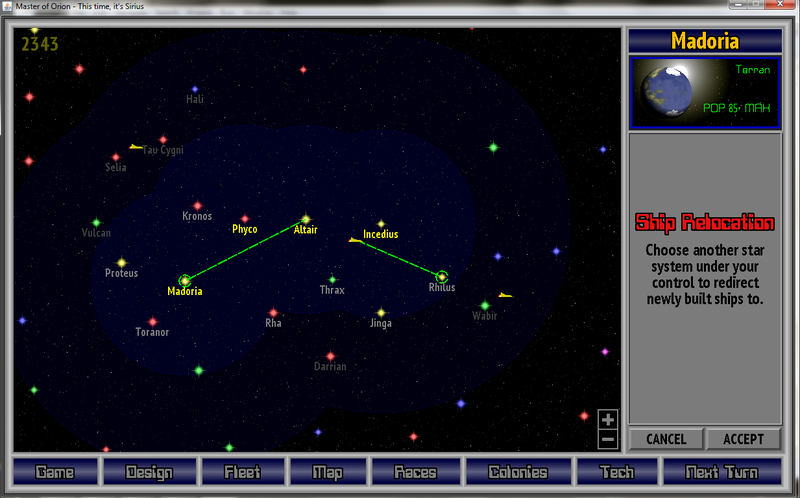 I just finished a “polish” item for this phase, adding circular and square grid overlays for the galaxy map. Both are toggle-able. 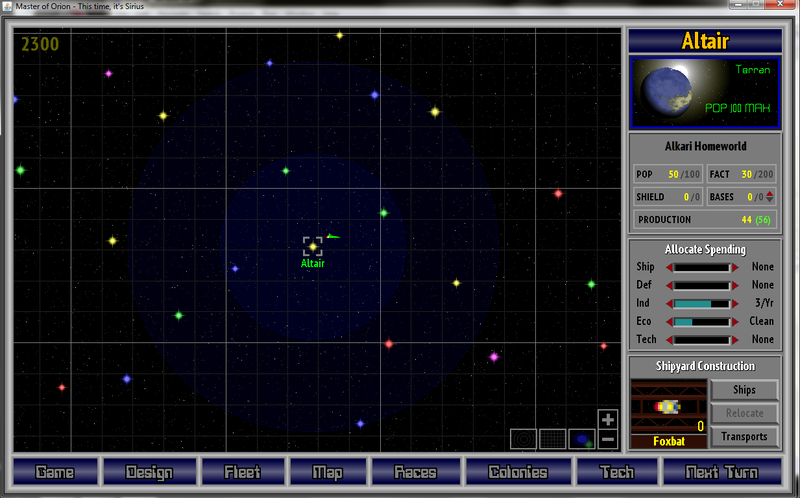 The square grid is fairly static, but the circular grid is centered on whatever star or ship you have selected. 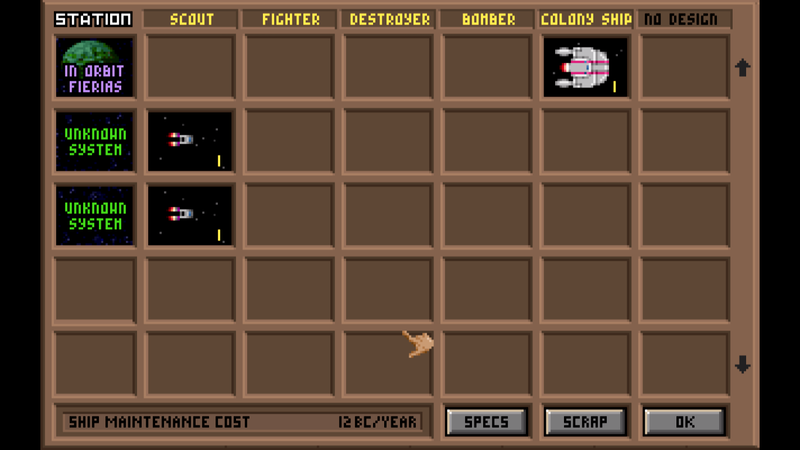 A ship is shown in the screen shot for the example. You can combine this grids as well. Below is the square grid. 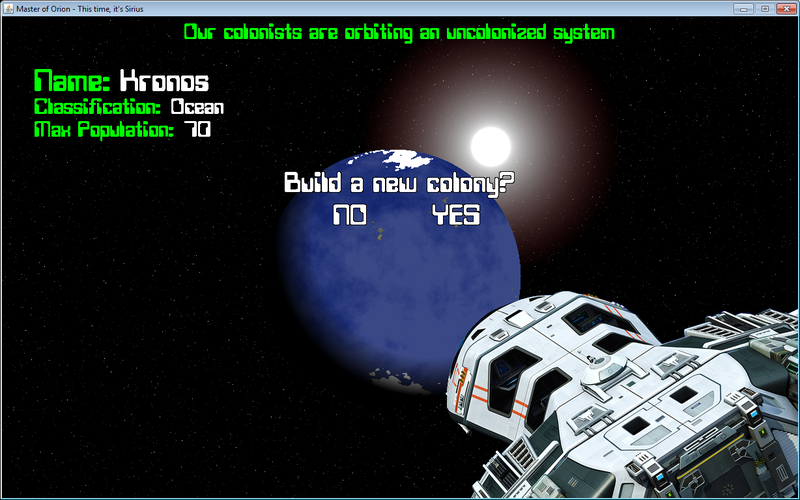 Now you will be prompted to colonize a planet when your colonists arrive rather than having the game do it automatically (which you may not always want). Two item Phase 2 items are completed today, plus another one I realized a need for. Ship relocation is now in the game. 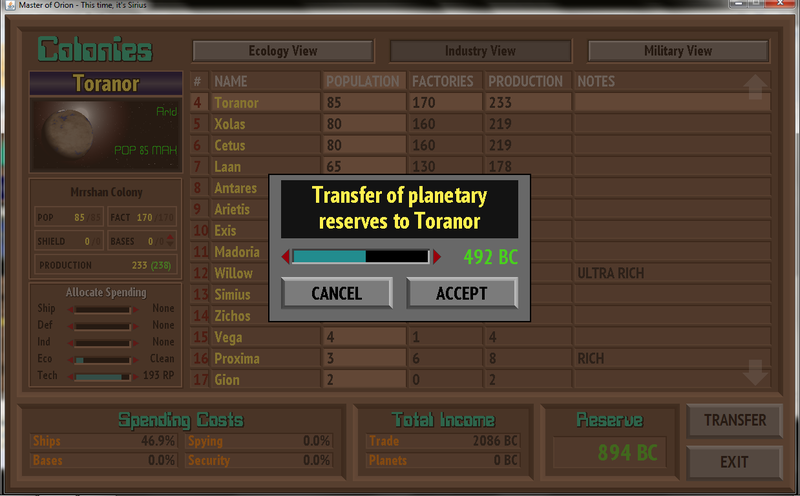 This means that you can have newly-constructed ships automatically redirected to another colony of your choice. This was a great feature in the original game because it made it easier to marshall your fleets on important border colonies from industrialized colonies safely ensconced within your empire. 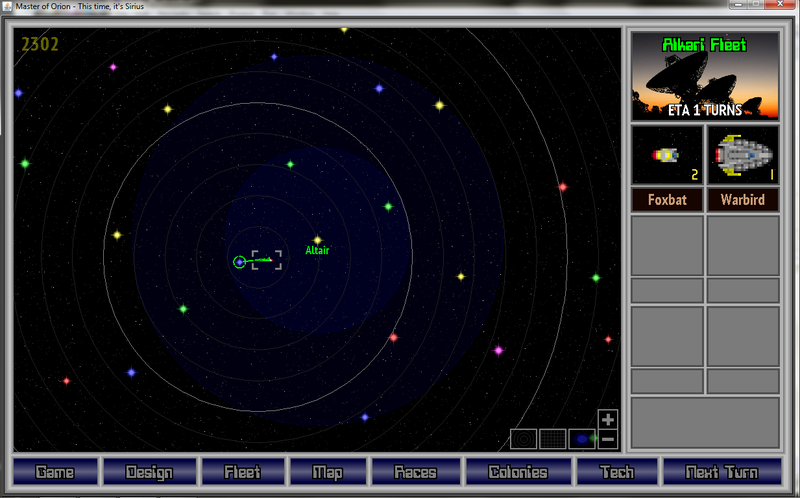 Also, the stars on the map now have lens flares and will twinkle. Finally, the area of space reachable by your ships is now colored differently (for both normal range and extended range ships). This makes setting up your scout ships much easier and also provides an informal border for your growing galactic empire. In this shot, a Ship Relocation is being set up from Altair to Madoria. That’s it and Phase 2 will be done. 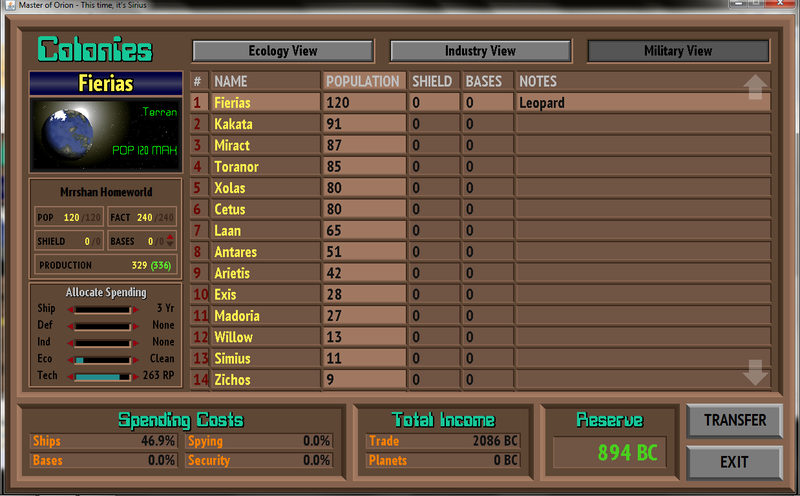 That’s hopefully just 3-4 more weeks of work and a completely playable and polished solo game will be in the can. 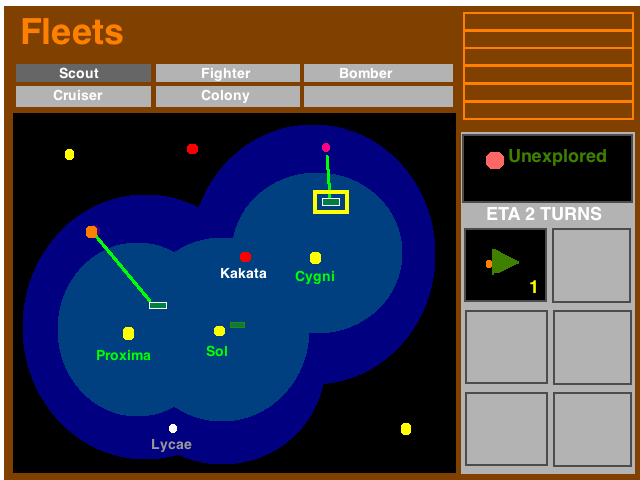 Then I can take a brief break and start on all of the alien race interaction in Phase 3! Secondly, displaying a transport in transit. There was a lot more work required that what these two screens show, but examples of all of the validation errors that can be displayed to the user make for boring screenshots. Also, I had to ensure support for redirecting transports once Hyperspace Communications was learned. After finishing the Colony Listing UI a few days, I entered this past weekend with a list of what remains for Phase 2… there were two significant UIs to do, plus 35 known items for minor features, bugs, or polish. I decided to focus on the 35 because it is an intimidating number, and also because I didn’t really want to start on the Fleet listing UI yet. 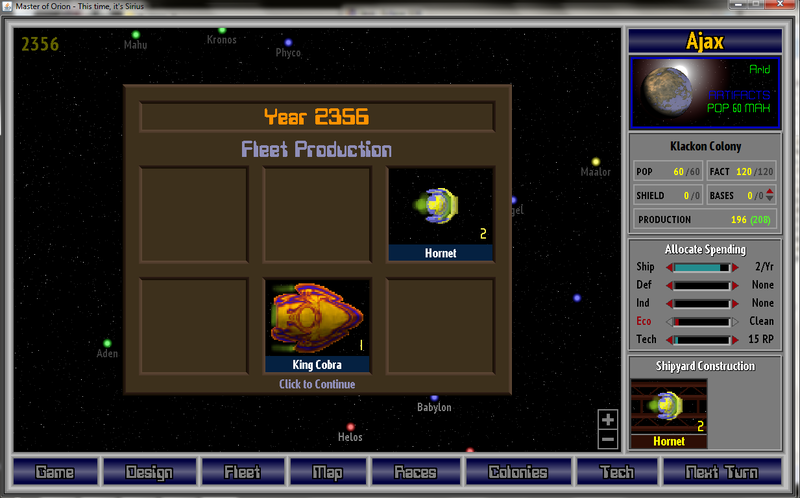 Here is a screenshot of a new feature that allows the player to color his ships. And below is the implementation of the notification of when you’ve completed construction of ships. Transports and ship relocation are coming soon (i.e. 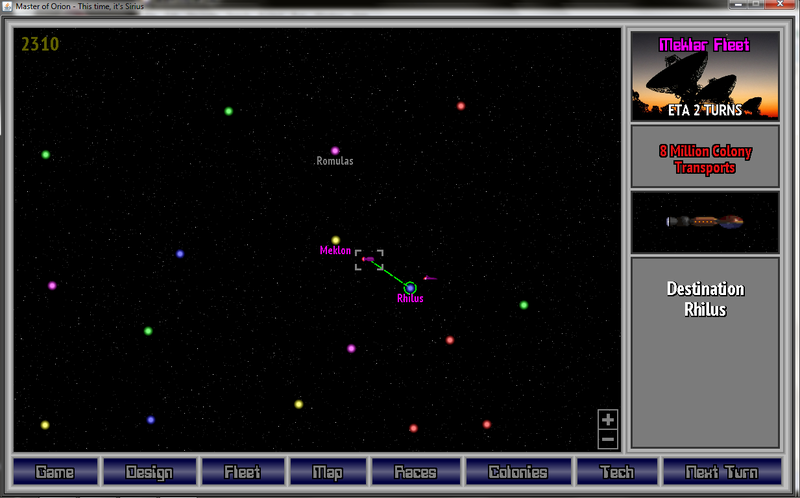 in a few days), followed by the addition of nebulas into the galaxy and cloud graphics on the rotating planets. The goal was to fix most of those issues and generally make it more useful. I broke the data up into 3 views (Ecology, Industry and Military) with the planet name and population as common fields in all 3 views. The up/down buttons are removed and scrolling is done with any of the standard 3 techniques: mouse wheel, up/down keys or clickable arrow overlays on the list. Of course, all of the columns are sortable. 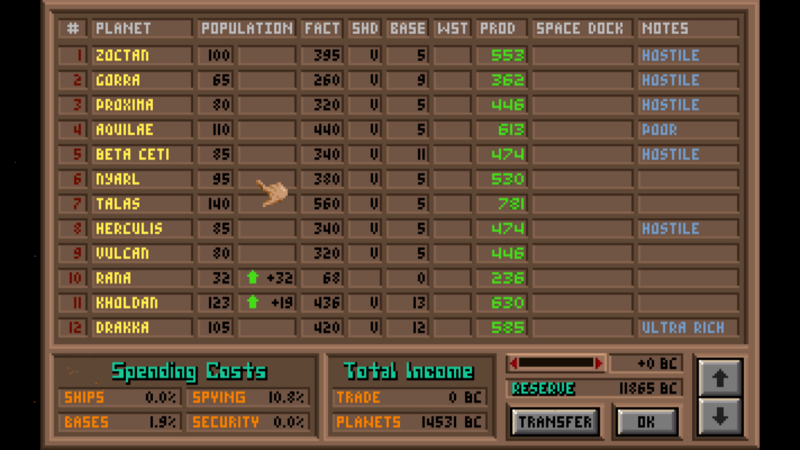 Most importantly, I added a display for the selected colony that would allow you to set its allocations without leaving the screen. 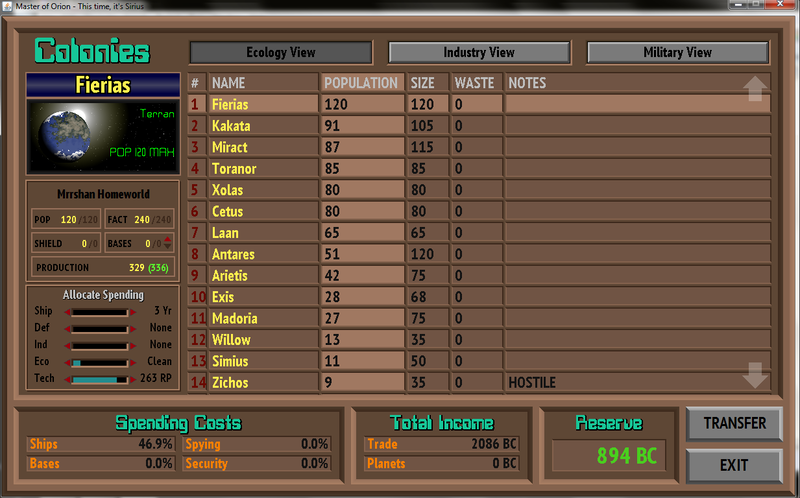 That is a huge boon for managing large empires. 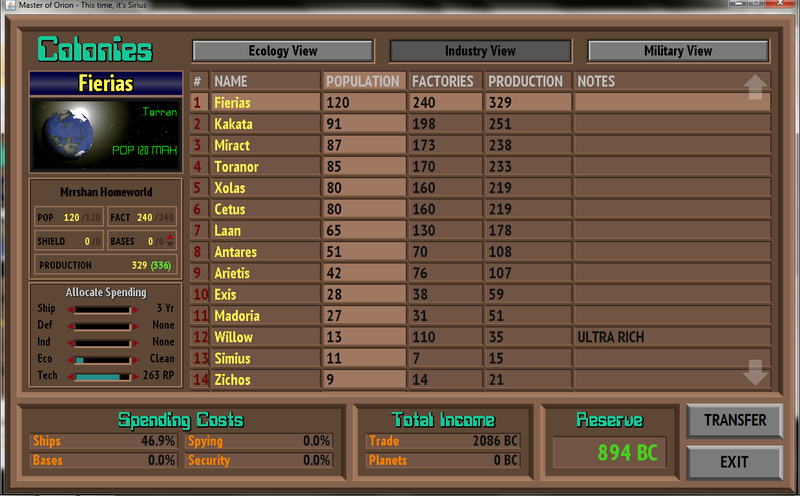 Below are 4 screenshots… the ecology view, the industry view, the military view and the transfer reserve feature. There’s still a lot of work left for Phase 2, but just two big screen efforts and a lot of smaller features (transports, etc).